As opposed to some of the marathon events that have taken place thus far at this World Series of Poker, this event had short days. Winner Philip Tom took seven hours to beat his table in day 1, and only five hours to beat his table in day 2. Today took a mere seven hours, including a one-hour dinner break. But these hours were action-packed, full of fast short-handed play. Certainly beating three tables full of players takes a severe degree of skill. Through all of that, Tom rose to the top. To get there, he had to make it through Cort Kibler-Melby in Day 1 and Bill Blanda, Remy Biechel and Ariel Schneller in day 2. 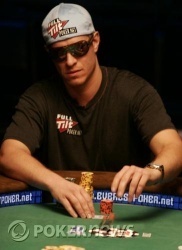 Tom's final table road would be the toughest, though, as he had to contend with wunderkinds Greg "FBT" Mueller and Tim "Tmay420" West - both of which likely had thousands of more hands of poker experience to their credit. Indeed, it would take over 100 hands of six-way play before a single elimination took place. After that, though, the bustouts came fast and furious. Tom didn't start much, though - three out of four of the bustouts leading to the final two were at the hands of other players. He played a game of stay away while he watched the carnage, picking up small pots along the way to build up his stack. Hand #163 of the 17-hand heads-up match with Mueller was likely the pivotal one. Tom limped in and Mueller raised to 225,000. The flop was . Mueller checked and Tom bet 225,000. Mueller made a big check-raise to 650,000, but Tom went all in over the top and induced a huge laydown on Mueller's part. Mueller would never recover, and the tournament was over thirteen hands later. Phil Tom is all smiles now as the photos are taken. Now, he can enjoy his first World Series of Poker bracelet. It's his second cash in this year's series thus far, and it may not be the last. Hand #176: Phil "The Chairman" Tom Wins! Before the flop, Greg Mueller limped from the small blind/button, and Phil Tom checked his option. The flop came and both checked. The turn was the . Tom bet 150,000, and Mueller raised it to 350,000. Tom waited about a minute, then reraised enough to put Mueller all in. Mueller quickly called. Both had flopped top pair, but Tom's ace-kicker had him in front. The turn was the , and "FBT" needed an eight or his day was done. 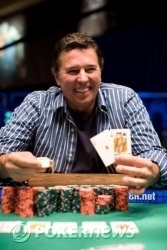 The river was the , and Phil "The Chairman" Tom won his first WSOP bracelet. Greg Mueller takes home second-place prize money of $298,638. 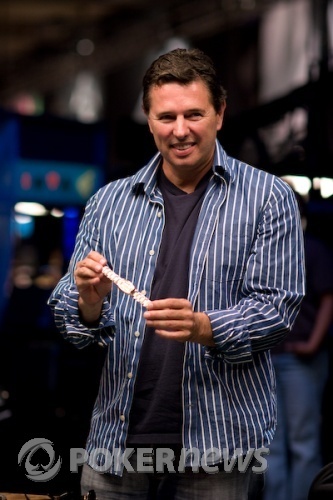 In addition to the bracelet, Tom wins a cool $477,990 for winning his three tables at this year's Shootout. Phil Tom has the button. Tom raised to 150,000 and Greg Mueller folded 9-3 face up. Greg Mueller once again limped from the small blind/button, and Phil Tom once again checked. Tom bet 150,000, and Mueller folded. Phil Tom has the button. Tom raised to 150,000 and took it. The flop came . Tom checked, Mueller bet 50,000, and Tom folded. Phil Tom has the button. Tom limped in. Greg Mueller raised to 200,000. Tom called. The flop was . Mueller shoved! Tom did not make an immediate decision. The all in bet was 595,000. Tom called! Greg Mueller limped in from the small blind/button, and Phil Tom called. The flop came . "The Chairman" must have liked that board, as he bet 150,000. Mueller folded.